He had so little to lose, a battered case full of old clothes, the risk of having to wait two or three weeks for his pension cheque before he shoved off. He had stood it for three weeks. He could take the same again. He was that much time further from arrack, and considerably less jumpy. He could sleep on the floor and he knew the drill. He didn't think Irish Swami's mind could hold many surprises for him. As for his own position, he had from the beginning behaved like a born slave to this exuberant and exacting eccentric. He didn't believe his position could deteriorate. He did what was asked of him in connection with things. He gave away all clothes and belongings except his typewriter and manuscript, which he spread in chapters under his mat. He tried to use the title of respect, Swamiji, but the name of Ayrishswami was so deeply cut into his memory that the Swami, amused, said it didn't matter. At first he took little mincing steps to avoid losing the lungi, which was a straight piece of cloth tied round the waist like a towel but pleated in on itself like an unsewn skirt to allow for a full stride. Also he was afraid of tripping over the hem. Once he found he was secure in the new dress, he discovered the problem was really bare feet. 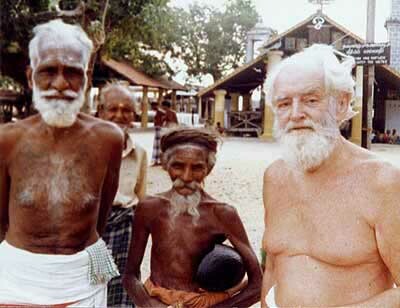 He showed Irish Swami his lacerated soles after a walk, and begged to be allowed to wear sandals. No. No sandals. There was a reason for that too. A barefoot European in these clothes would immediately be recognised as a seeker, and men, and specially women, would leave him alone and relate themselves accordingly. There was one thing that Christopher knew he should now do, which he tried to do, but could not. He could not prostrate before the Swami as Paul and Ramesh did. Every time he thought he was going down something locked in his spine and he stood stiff and ill at ease, raising his joined palms as high as he could in respectful substitution. 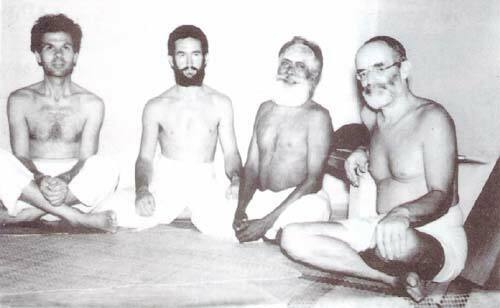 Archival 1960 photo of German Swami Gauribala (at right) with disciples including Sandaswami (Lord Soubury's son, far left) and Narikutti Swami of Australia. What made this embarrassing was that when he asked Irish Swami to accompany him into the temple for a puja he had no trouble in getting down flat on his belly before the idols. Irish Swami no longer went to the pujas himself. He preferred to stop in the courtyard with local religious heads of the regions or the temple trustees or visiting students or just about anybody. He first took Christopher into the temple when it was empty save for a top-knotted priest and a matted ascetic who had been sitting in a corner all day. He immediately showed Christopher how to apply the red and yellow powders to his forehead with the third finger of the right hand. "There you go asking questions. You don't have to know what they are. Just do it. There is efficacy in the puja. If you don't believe that what's the use of my showing you? There is efficacy in everything I tell you, so just do it. Let's get going. The puja starts here." Here was a pair of closed doors that shut Muruga into his own temple within the temple, and before these Christopher was to wait upon the god respectfully with folded arms. "Not like that. You're not a tourist leaning up on himself for comfort. You stand respectfully like this with your palms against the front of the upper arms. Go and see the statue of Ananda at Polonnaruwa." (later he produced a photo). The priest would lead the worshippers in a circumambulation of the various shrines. The major ones were those of Ganapati, the elephant god, Shiva's other son and therefore brother to Muruga. Christopher had no trouble in laying himself flat on the floor for him or to the snake in the pit who was fed at every puja. On his way back he pulled at the bell as Irish Swami showed him. Everybody pulled it to call Muruga's attention, and then they were in front of Muruga's closed down. The great final prostration was here. Irish Swami as guide threw a glare. It was only by himself, lost in the stream of circumambulatory worshippers, that Christopher broke out of the Seahard Chapel capsule. The din of the conch and drums acted like the trumpets on Jericho's walls. Christopher stretched out on the floor knowing for the first time the full extension of his body and mind. He was making up for a lifetime's deprivation of ritual. He entered the enclave and dropped into the oceanic current. The drums and conch delivered him from all maneuvers of speculation but for a thudding insistence that he had surely been saved from perpetual deprivation. Their crescendo lightened all burdens and warmed to life an intelligence inert and frozen under the tension of a frantic intellect. The murmur and sough of exordium called imperfectly under the percussive clamour. The conch screech glanced the surface of his skin with inorganic fingers. He abandoned himself. He completed the circumambulation, and after ringing the bell for Muruga waited quietly with folded arms before the closed inner shrine. Restlessness was dead. He had not gone round the temple, but he agreed with Irish Swami that he had circled the world. The doors burst open. Muruga, ringed in cosmic flames peacocked in splendour, aimed his spear at him. He brooked this agonizing danger repeatedly. He never got used to it. He stood helpless waiting for impalement, unable even to join his palms. Had he been capable of moving forward to breast the spear he could have charged right through what menaced him. But the spear tip held the initiative over the latent surge of his muscles. They would not contract; seemed superfluous in his moment of need... until the shouted laudation released him for the epiphany. "Haro-hara!" he called, and called and called again. He lay full-length seeking the curve of the worn stone. He listened. He heard his own systolic and diastolic pulse deep under the paving. He sank into the tread of ritual measure. It led him to a grey-brown birth... to the sacredness of repetition itself, the involuntary drumming of animal courtship and the beat of mating wings. He heard the strut of feet around the golden calf. It tipped the spear with Moses' anger. His ear opened to the forbidden. It saturated his blood and sealed it from other thirsts.